Was chatting with Darren at Darren’s CCIE mission yesterday. We started to discuss some of the commands we frequently used to check IP addresses etc. He thought I should do a post on it and here it is. This first one I stumbled upon when I was going to type show ip prot but accidentally typed show ip port which turned out to be a good thing. This command show port mappings for different protocols used by IOS. If we get a task on lab to do filtering and can’t remember the port this can be really useful. As you can see we can do an include to match on a port number or a protocol name. 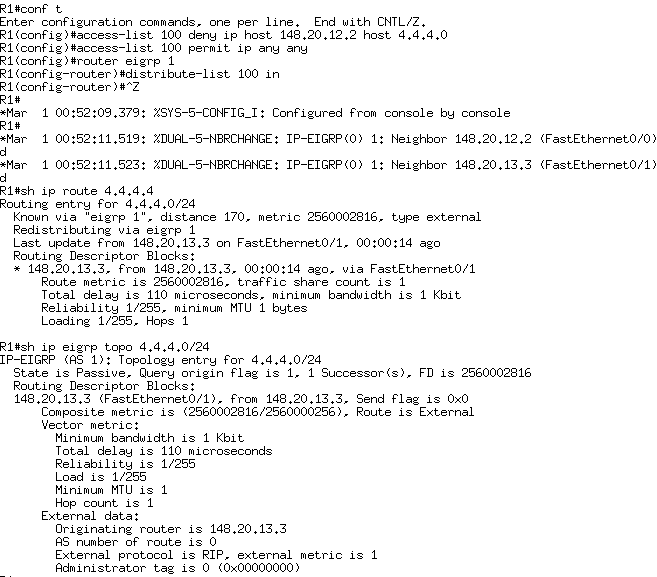 The next command is one of the commands I use the most, show ip int brief | ex una. This will list all interfaces that have an IP address configured. This is good but it will not tell us the netmask. 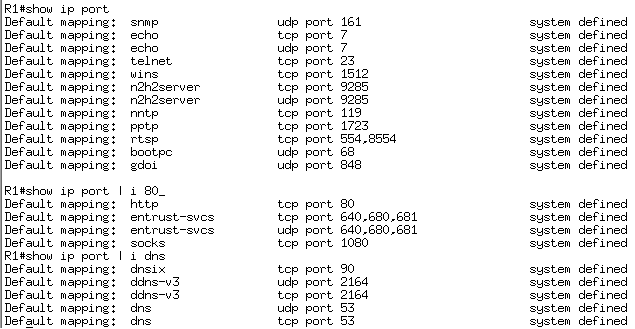 If we have a troubleshooting task it is nice to check what IP’s are configured and if the correct netmask is used. Wit the next command we can check the netmask. Show ip int | i Internet. If I want to verify reachability quickly I need to list all IP address configured on the devices. I use the show ip aliases command to do this. I paste the command in including a line feed on all devices and then hold alt down while I mark all the adresses. This post should give you some tips on how to quickly discover IP addresses configured. also has distance vector features but the truth is that it is a distance vector protocol. couple of different ways of filtering in EIGRP. I will show how to filter the route. R3 is configured exactly the same. Let’s see if we can see the prefix. Indeed we can. Now let’s look at our filtering options. a standard access-list matching our prefix 4.4.4.0/24. but that might not be possible if R1-R2-R3 were connected on a common Ethernet segment. announcing the prefix and the destination will be the prefix we want to filter. don’t work for some reason. That worked as expected. We now only see the route from R3. any prefixes that are longer than /24. Let’s check that it is reachable from R1. Indeed it is. Now let’s filter this with a prefix-list. Hey! Where did all my routes go?! We forgot to permit everything else with 0.0.0.0/0 le 32.
specific we can tie this distribute-list to the neighbors and even interfaces. the lower the AD the more trustworthy a route is. What happens if we set it to 255? the routing table. Let’s try that. We start by adding some prefixes on R2. redistributed via the network command and one that is redistributed via static. 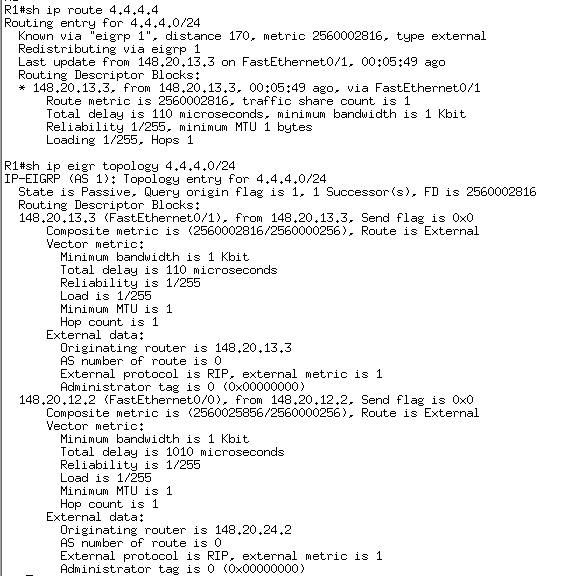 Let’s look at the routing table of R1. First notice that 22.22.22.0/24 is an internal route but 222.222.222.0 is an external. 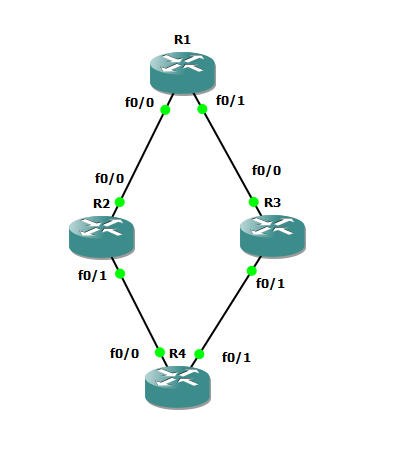 is the possibility to create a static route and redistribute it via the network command. want to install any external paths. This is the current state of R1 and external routes. We will set the AD to 255 for all external routes. Now the routes are gone. What if we want to filter a specific internal route? which is the route that we want to filter. There is one more type of filtering I would like to show and it is the route-map. We will configure a route tag on R3 and match this tag on R1. First we look at the route to 4.4.4.0/24 on R1, it is installed via R3. Then we configure tagging on R3. Now we configure a route-map that matches the tag and denies the prefix. We can even do more advanced things like matching on source-protocol or metric. Now look at the routing table. 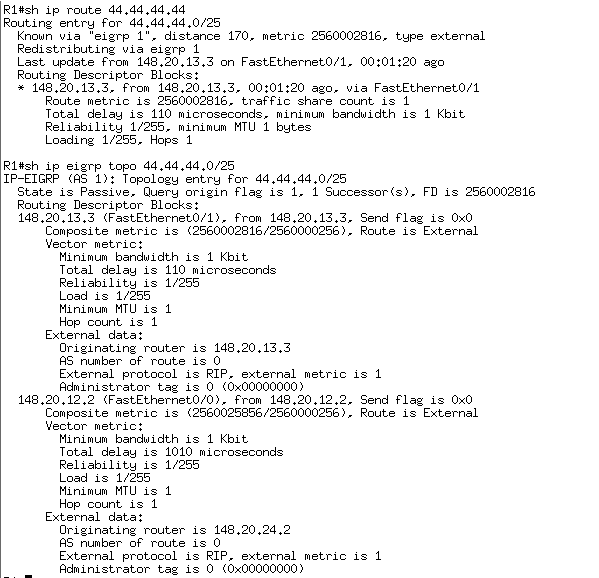 Only the routes that were not source from RIP are still in the routing table. in EIGRP. The possibilities are endless! 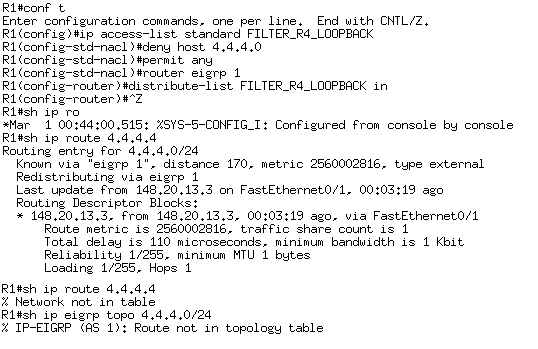 Then you enable EIGRP and run network 163.19.11.1 0.0.0.0 and 163.19.22.2 0.0.0.0 respectively on each router. Will they be able to form an adjacency? Post your answer in the comments section. 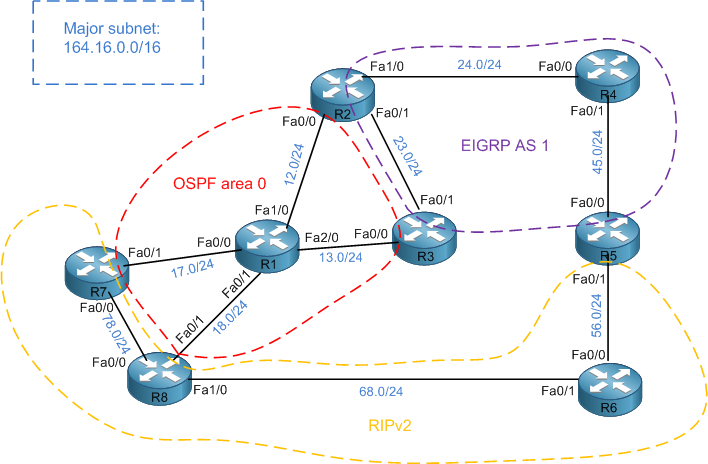 This post is by Brian McGahan on OSPF type 5 E1 vs E2 routes. It explains in detail how the OSPF state machine works and busts a few myths on OSPF metric calculation. Remember that OSPF prefers E1 over E2 regardless of metric. A common misconception is that E2 does not use cost to ASBR when calculating metric. Read the post to understand why this is wrong. To be a CCIE we need a good grasp of switching and STP. This post by Petr Lapukhov (again) is one of the best I’ve ever seen on STP. This post describes PVST+ in detail. Read it here. I’ve added some more flashcards. The latest addition contains some questions on QoS, EEK, BGP and OSPF authentication etc. The total number of flashcards now exceeds 260. Download as usual from here.